Apart from general physical characteristics like density and rigidity, solids depict another important property called Conductivity. Conductivity is defined as the measure of a solid to ease the flow of electrons and conduct electricity. The values of conductivity are diverged and vary from 10-20 to 107. The unit of conductivity is ohm-1 m-1. The solids which allow current to flow through them very easily are called Conductors. The conductivity of solids lies between 104 to 107 ohm-1m-1. Metals are generally good conductors of electricity as their conductivity is generally near to 107 ohm-1 m-1. The solids which don’t allow electricity to flow through them are called Insulators. The conductivity of insulators is majorly low with the range of 10-20 to 10-10 ohm-1 m-1. 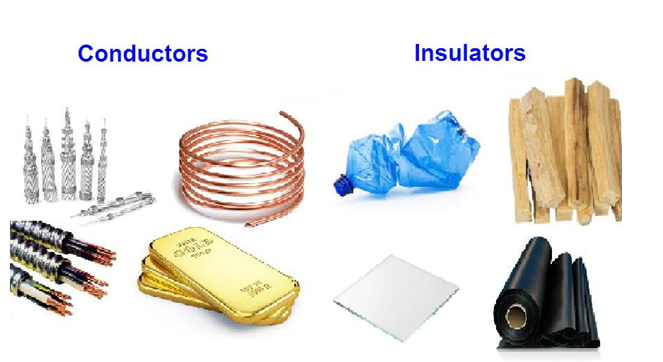 Some common examples of insulators are plastics, rubber, wood etc. A conductor can conduct current in two ways either by the flow of electrons or by the flow of ions. In metallic conductors, the flow of electric current is possible due to the flow of electrons and in electrolytes, the same is possible due to the flow of ions. Metals have the potential to conduct electricity in solid and molten phase. The value of conductivity relies upon a number of valence electrons available per atom. The atomic orbitals of metal atoms are responsible for forming molecular orbitals. The energy level of molecular orbitals is nearly same to form bands. When the band is half-filled or partially filled the electrons can flow easily from one band to another, thereby making the electron to flow under an applied electric field. Taking the case of semiconductors, the gap between valence band and conduction band is small. Due to this small gap, some electrons can easily jump from valence band to conduction band, thereby showing some conductivity. Electrical conductivity is directly proportional to temperature as the electrons get more energy to move from one band to another. Semiconductors which are made from only one or pure semiconductor are called Intrinsic Semiconductor. 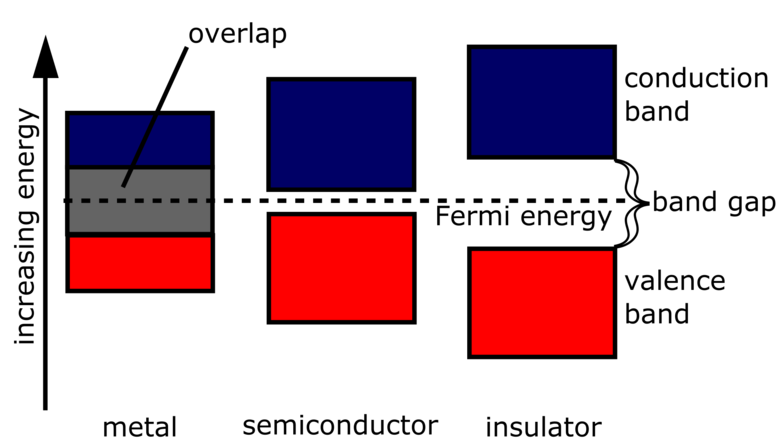 Some common examples of intrinsic semiconductors are silicon and germanium. Also, the conductivity of an intrinsic semiconductor is very low and of no practical use. To make intrinsic semiconductor applicable we increase its conductivity with the help of doping. Silicon and germanium are present in group 14 of the periodic table with four valence electrons each. They can form four covalent bonds with other neighbor atoms. When we dope silicon and germanium with electron rich impurities like Phosphorus P the five electrons present in P form bonds with Si and Ge. One extra electron left becomes delocalized and is responsible for increasing conductivity of silicon and germanium. The semiconductors from this type of doping are also called n-type semiconductors as the conductivity is enhanced due to the addition of negatively charged species. When we dope silicon or germanium with electron deficient species like Boron (B) or Aluminium (Al) we obtain p-type semiconductors. Out of four electrons present in silicon, three are used to form covalent bonds with Boron and 1 electron is left unshared. The place where the missing fourth electron is located is called Electron Vacancy or Electron Hole. An electron from nearby atoms comes and fulfills the vacancy.